Crawley Town have not ruled out the possibility of more business today on transfer deadline day. However no players are expected to leave the club, despite bids being received for three or more of them. Newspaper reports have said a bidding war is going on for Josh Payne between MK Dons, Notts County and Motherwell. Other sources claim that Jordan Roberts is also in hot demand with Blackburn Rovers, Burton Albion and Shrewsbury all after his signature. Speaking yesterday afternoon, Reds director of football Selim Gaygusuz said he was delighted to have signed attacking midfielder Karlan Ahearne-Grant on loan from League One club Charlton Athletic until the end of the season. 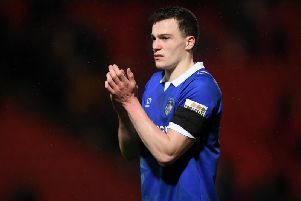 An earlier bid for Aaron Burns from Northern Irish Premiership club Linfield was not accepted and the player instead joined his current club’s rivals Coleraine. Gaygusuz did not expect anymore new signings before the end of the transfer window, although he did not know for sure. The Reds chief was pleased they are not going to lose any players going out to other clubs. He said: “There is no-one going - we have had bids for our players, more than two, but no-one is going as everyone is happy. “We have a good, stable team and we want to be successful, we have a good squad and we want to keep our players. “I do not want to identify who they are as we want to keep everyone focussed for a very important game on Saturday (away to Chesterfield). This shows the football is going really well and it is nice other clubs are coming to watch us. Speaking after yesterday’s signing of Ahearne-Grant he said: “I am very pleased we have signed Karlan. He has a lot of experience already for such a young player and he played against us in the Checkatrade Trophy.